One of the best places to see spawning salmon near the Metro Vancouver area is the Weaver Creek Spawning Channel in the Fraser Valley. Weaver Creek runs through the District of Kent from Weaver Lake through to the Harrison River. 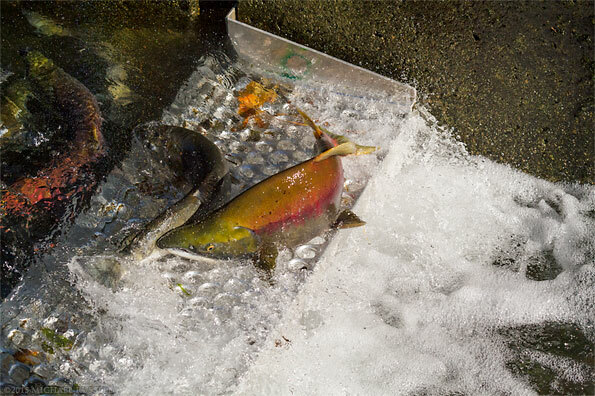 In the fall Fisheries and Oceans Canada opens the channel area to the public to view the spawning salmon. 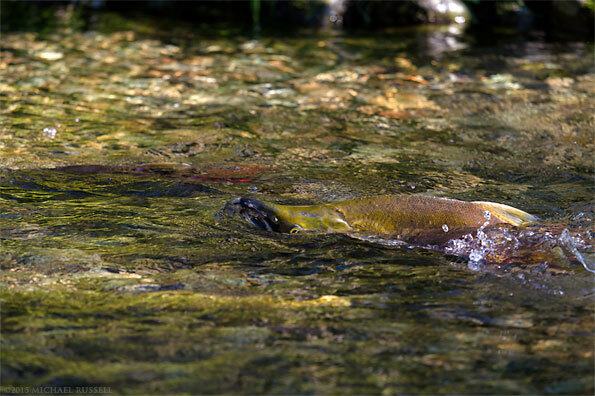 I first came here as a kid, but have returned a number of times in the past few years to photograph the salmon. Without an underwater housing and other special equipment most of the photographs one will be able to create will be looking at the salmon in the water, or jumping out of it. Photographing fish under water, from above, just leads to distorted salmon photos that don’t really work most of the time. 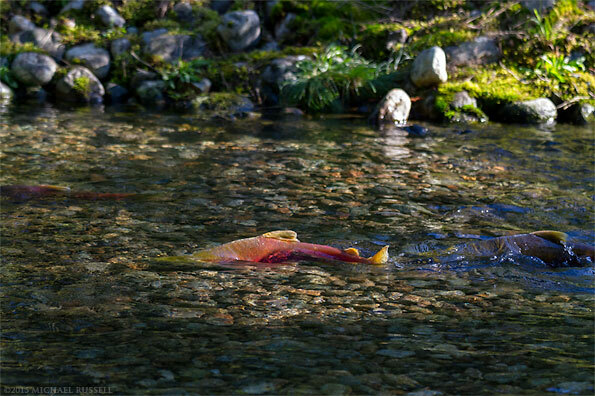 After a few years of failed attempts at salmon photography I worked within these limitations and imagined a photograph with the salmon backs out of the water, with a glow from sunset or some other sort of reflection on the water. I did manage to create that salmon photograph eventually but it remains a bit more abstract than the images on this page. Throughout the channel there are “aeration plates” that add oxygen to the water but also likely prevent erosion of the small rises in elevation between the sections of the channel. 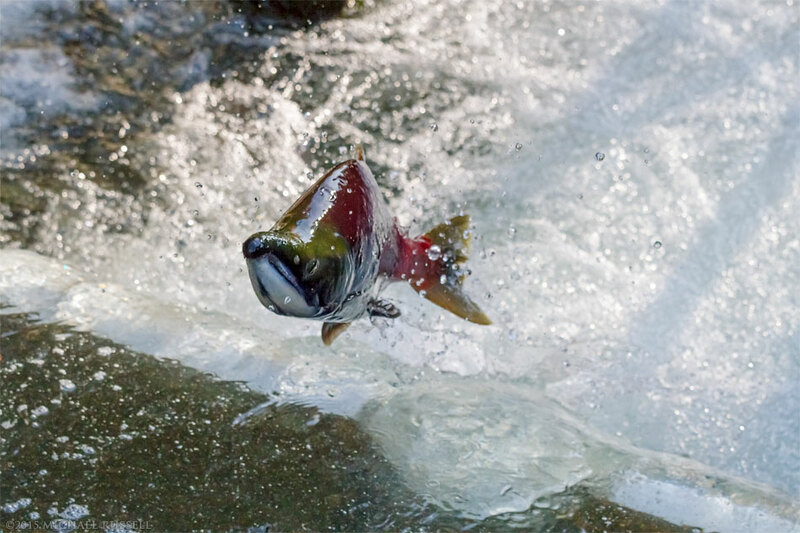 The first image in this post shows a male Sockeye leaping into the air to get over one of the higher jumps to get into the channel. The aeration plates in the upper part of the channel are considerably lower. One of those is shown in the image above. Sometimes the salmon don’t quite have enough momentum or strength in order to get over the plates. This one came close, was swept back into the lower level but made it on the second attempt. For more photographs of salmon and other wildlife please visit my Animals & Wildlife Gallery. I work for a UK based production company called Passion Pictures. We are currently producing a feature documentary about the ‘rules of nature’ and the regulation of ecosystems. We are particularly keen to focus on Salmon for a portion of this documentary and I have been tasked to find images of Coho Salmon, swimming in the river similar to the Sockeye images you have above – I thought I’d get in touch to see if by chance you had photographed any Coho salmon and if indeed you would potentially be interested in allowing us to use your images in our artwork?